I want to implement an algorithm that calculates an account's 95% value at risk on a monthly return base. The case I want to describe in this question is rather academic and will probably never happen in real life. I am wondering what happens if an account has never suffered a negative return, i.e. has always made money instead of loosing. Is the VaR 0 in this edge case (since the account never lost money, hence there is NO value at risk), or is the VaR negative (since the account always won money, hence the account's capital being at risk is negative and therefore is expected to grow, even in the worst case)? By definition, your loss cannot be positive, so you'd set the VaR to zero. But it really depends, on how you calculate your VaR. If you calculate your returns, sort them and look at the 5% quantile (which, as you say, may be positive), then you'd simply set your VaR to zero. But if you treat your returns as realizations of some (unknown) random variable, then just because you don't have any negative returns, that doesn't strictly mean that the random variable cannot be negative. which as you can see also has data for negative values, and you'd probably want to use that to calculate VaR. Further to my comment on rbm's answer regarding negative VaR, consider a distribution with mean return = 7% and standard deviation 2%. In a typical sample the returns are all positive, as the OP describes. 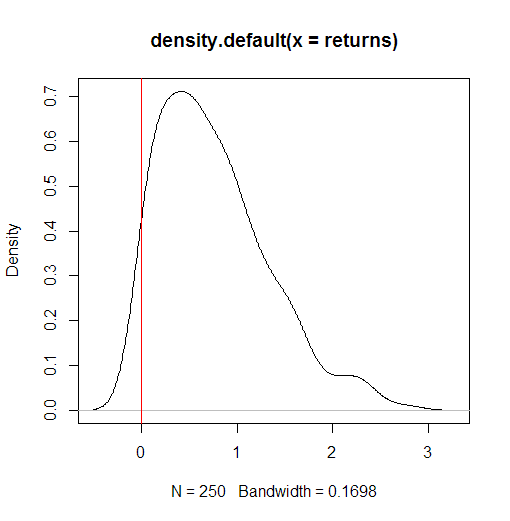 The 5% quantile return is 3.71% so the VaR is -3.71% of the total asset value. A negative VaR would imply the portfolio has a high probability of making a profit. Not the answer you're looking for? Browse other questions tagged statistics var value-at-risk statistical-finance or ask your own question.